"Where are we going?" asked Bonnie, the pretty pink butterfly. "We’re not going in the same direction as the rest of the rabble," she noted. "Now that its warmer weather in Scotland, the rest of them are heading up north. I thought it would be nice to stay in the southern half of the country for a while. I hear that up in Campbeltown the loveliest and bluest bluebells grow," Bruce answered. "I’m rather partial to bluebells now that I’m a blue butterfly." "I hope its not much further. Your blue wings might be able to fly forever, but my wings are getting tired from all this flying," Bonnie complained. "Not much further. We just have to go to Kintyre. It’s a peninsula, you know," Bruce said. "It’s where some land juts out into the sea. Sometimes it’s a lot of land; other times it’s only a little land. Kintyre is surrounded by sea on three sides. That’s why Campbeltown used to be a fishing port. It’s on the southeast side of the peninsula." "Let’s just hurry and get there," said Bonnie. The day was half way over when they approached the town. "Oh, this is a pretty town. There are hills and stones and water, but where are the bluebells?" Bruce looked down and saw a field of blue growing near the shore. "I see them. Follow me!" "I can smell them already," Bonnie said. They fluttered down and landed on the flowers. "Yummy. This nectar is delicious," she said, sipping it from the little bell. "I like bluebells." "This town used to be the busiest herring port in Europe," Bruce said. "Herring is a fish, isn’t it?" Bonnie asked. She raised her antenna and looked into the loch. "I don’t see any fishing boats there now." "I said it used to be, Bonnie. I know its not anymore. I also heard that at one time there was a distillery on every street of the town. This is an interesting little place," Bruce said. "Distillery? You mean they made whiskey there?" Bonnie asked. "I thought I smelled something like that," she said, sniffing the air. "I like it here. I hope there aren’t any big birds flying around. I wouldn’t know where to hide." "You mean like that one over there?" Bruce said, pointing to a seagull. "Yikes! It saw us!" "What will we do? Where will we go? I don’t want the seagull to eat me," Bonnie cried, flying into the air. "Here it comes. Quickly, Bonnie, follow me," Bruce urged. 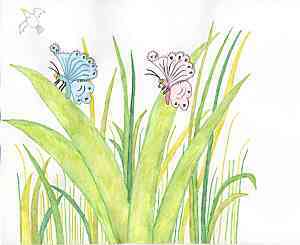 The two butterflies flapped their wings as fast as they could. SQUAWK! SQUAWK! SQUAWK! The seagull flew towards them. "Hurry, Bonnie. Hurry!" Bruce called. Up ahead he saw some rusted metal, piled high. Tall grass was growing around it. "Over there. Quickly, Bonnie." They swooped under the old metal pile just as the seagull caught up with them. "It’s still out there," Bonnie whispered a few minutes later. "It’s sitting on an old wooden fence post, waiting for us." "I hear it. We’ll just have to stay in here then until it leaves," Bruce said. "What is this stuff we are hiding in anyway?" Bonnie asked, looking around. "I think its part of a ship. They used to build ships here too, a long time ago," he told her. "Why do you seem to know so much about this town?" Bonnie wondered. "When we were down south, I listened to some of the other butterflies. They told me about a lot of different places in Scotland. I know where the best flowers grow, where there are other insects like bees, and where not to go too," Bruce said. "If we were still white butterflies, the seagull wouldn’t have seen us, would it?" Bonnie asked. "No, probably not, but it’s much nicer being blue. You like being pink now, don’t you?" he asked. "Of course, but it makes us easier to spot," Bonnie replied. She peeked out through the rusty metal. "I think the seagull is gone now. Can we go back to the bluebells?" Bruce cautiously flew over to a blade of tall grass. The seagull was gone. "Coast is clear now," he called. Bonnie came out and landed next to him. "You want more bluebells? Follow me." Bonnie watched over her wing as they flew quickly. She could see other seagulls flying over the water. They were searching for fish. Just as they touched down on the bluebells, they heard squawking and it was close. SQUAWK! SQUAWK! SQUAWK! "Oh no. The seagull is back," Bonnie cried. She flew down to the bluebells and hid under the leaves. "Hurry, Bruce, before it sees us." They hid and sat quietly. The seagull hovered above them for a few minute, searching. "I don’t think it sees me because my wings are blue, like the flowers." "What about me? My wings are pink," Bonnie said, frightened at the thought of being eaten. Bruce put his wings over hers. Soon the seagull flew off towards the sea. "This place is too dangerous. Lovely bluebells or not, I say we go somewhere safer, where there aren’t as many birds," Bruce suggested. "Fine with me," Bonnie said. "Just let me gather some more nectar and pollen and then we’ll be off." In a few minutes the butterflies were flying up the peninsula, staying as far away from the coast as they could. "I’ll always remember Campbeltown and its lovely bluebells," she said as they flew towards safer ground. If you'd like to learn more about Campbeltown, Kintyre, Argyll, Scotland then click here!